* I'm honestly addicted to Ben & Jerry's Chocolate Fudge Brownie flavor. * I love family & friends so much, without them I'd be nothing. - The first person I nominate is Ally (yes my twin sister, but not because of that) She's so creative from the way she sets out her blog to the posts she creates. She's just got so much great things to share. - The second person I'm nominating is Lizzie because I think she was one of the first people I followed on here, I love the style of her blog and all her outfit of the days she's done. I think she really inspired me to try to make my blog really good. - The third person I nominate is Nadia because she's honestly been so lovely to me always giving me great feedback on my posts and in fact she was the first ever person to comment on one of my posts. I really look up to her because literally everything she posts is fantastic. - The fourth person I nominate is Rachel we've spoken a little bit but not that much and she's honestly so lovely. She's literally got only a few posts because she's new to blogger but the quality of the pictures and the way she writes is just up to such a high standard. I've been on blogger for maybe 2 months now and my blog hasn't even reached her level yet. Amazing. - The fifth person I nominate is Jessie her blog is literally incredible. Being the same age as each other is great because she says things that I take on board like maybe an outfit she might wear to sixth form then when I go shopping I try to take on board what she's said. - The sixth person I nominate is Emily I followed her from watching her YouTube videos, I think she's inspired me so much because she was like the first person I followed. She is so down to earth and is just a generally lovely person. Her posts are so great and she definitely needs more recognition. - The seventh person I nominate is Ellie (yes, I've known her for nearly three years but not because of that) I'd always wanted to have a blog but never really had the confidence in myself to create one, I looked at Ellie as my inspiration literally without her I wouldn't have created this. I love everything she posts and just know that if she wants to peruse this as a career she'd be fabulous at it. - The ninth person I nominate is Zainab (close friend from school, again not for that reason) We both kind of want to go into the same field of work when we leave school, we both thought about creating blogs roughly around the same time and it's so awesome to see how far she's come along. I know the future is very bright for her. - The tenth person I nominate is Shekinah (another close friend, think you're getting the fact it's not for that reason) I envy her in such a good way, she's such a style icon to me and a blog is the best thing possible for her to be honest. She needs the world to see her creative talents. 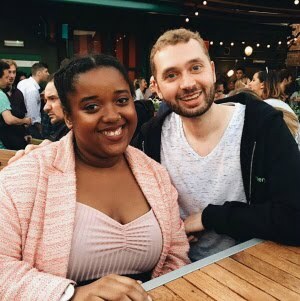 - The eleventh and final person I nominate is Raffaella (another one of my home girls, clearly not for that reason) She's literally really new to blogger, she is like a style guru and when she turns up to sixth form jaws literally drop because her sense of fashion is too much for everyone to handle. Her blog is already looking amazing and I can't wait to see what she has to bring next.